Is everyone ready for about 12 hours of UFC action? You’d better hope so, because fresh off of last weekend’s historic UFC 205 event from New York, the UFC goes global this Saturday with cards from both Ireland and Brazil on a day packed with fights. It all kicks off with a fantastic event from Ireland, headlined by an intriguing rematch between Gegard Mousasi and Uriah Hall to go along with a ton of newly acquired UFC talent looking to make a name for themselves. With fan-favorites like Ross Pearson and Ian McCall filling out the card and an awesome fight between ranked flyweights Kyoji Horiguchi and Ali Bagautinov, the UFC is delivering a solid offering to its Irish fans even after losing the main event dangerously close to fight day. Once things wrap up in Belfast, it’s off to Brazil, where Antonio Rogerio Nogueira and Ryan Bader will throw down in front of what should be a rowdy crowd in Sao Paulo. In a rematch of a pay-per-view co-headliner clear back at UFC 119, Nogueira is hoping the home-field advantage might help the odds swing his way after suffering a decision loss the first time out. Bader comes into the bout on short notice, but he knows a second win over Nogueira should be enough to get him the top-ranked competition he desires. Backed up by fights featuring top talent like Thomas Almeida and Claudia Gadelha, UFC Fight Night 100 definitely isn’t the worst way to spend your Saturday night. UFC Fight Night 99 takes place in Belfast, Ireland, this Saturday, kicking off with preliminary fights at 12:15 p.m. ET to whet your appetite before the main card takes place at 4 p.m. ET. The entire card will air live on UFC Fight Pass. UFC Fight Night 100 will conclude the day-long extravaganza, with the prelim portion of the card starting with a pair of fights on Fight Pass at 6 p.m. ET. From there, the card moves to Fox Sports 1, with a quartet of prelims airing at 7 p.m. ET before the main card at 9 p.m. ET. Combat Press writers Zach Aittama and Vince Carey preview both events in this stacked edition of Toe-to-Toe. UFC Fight Nights 99 and 100 both went through changes to the headlining bouts. For UFC Fight Night 99, the main event shifted from a welterweight clash between Gunnar Nelson and Dong Hyun Kim to a middleweight rematch between Gegard Mousasi and Uriah Hall. In the case of UFC Fight Night 100, Antonio Rogerio Nogueira lost his original opponent, Alexander Gustafsson, and now gets a rematch with Ryan Bader instead. Which event suffered the greater loss? Aittama: These events took a hit from injuries to Gustafsson and Nelson. Perennial title challenger Gustafsson returned to the Octagon in Hamburg, Germany, at UFC Fight Night 93. The Swedish light heavyweight made his anticipated return after nearly a year away after dropping a split decision to Daniel Cormier at UFC 192. Gustafsson has battled continuous injuries over the past few years and some devastating in-cage losses that led to “The Mauler” thinking about walking away from the sport in 2015. Gustafsson was shaken after falling victim to Anthony “Rumble” Johnson in the first-round of their UFC on Fox 14 bout in front of 30,000 fans in Stockholm, Sweden, less than 100 miles from Gustafsson’s hometown of Arboga. Gustafsson successfully returned against Jan Błachowicz. However, the performance left something to be desired from the former No. 1 contender. Gustafsson seemed further and further away from the fighter who went toe-to-toe with Jon Jones and the aforementioned Cormier in exciting five-round championship fights. The back injury that hampered Gustafsson in the past had returned. Gustafsson and Nogueira were previously scheduled to meet in 2014 before the Brazilian pulled out of the contest with a recurring back injury of his own. Now, Gustafsson is the one to pull out, but the replacement opponent is more than adequate to take his place. Bader was one fight from a title shot when he met the aforementioned Rumble at UFC on Fox 18. The opportunity quickly evaporated when Johnson stuffed the first takedown and put Bader away with strikes in less than 90 seconds. The defeat halted Bader’s five-fight winning streak that included victories over former UFC champion Rashad Evans, current Bellator champ Phil Davis and top-10 light heavyweight Ovince St. Preux. Bader returned to the win column in impressive fashion at UFC Fight Night 93 when the 33-year-old Arizona native shut the lights out on Sweden’s Ilar Latifi in a battle of top-10 fighters. Bader enters this match-up with Nogueira as the three-to-one favorite, despite taking this fight on about seven weeks’ notice. Nogueira surprised many with his first-round knockout of Patrick Cummins at UFC 198 in May. The 40-year-old entered the win column for the first time since taking a decision over the aforementioned Evans at UFC 156 in early 2013. Nogueira had previously won just two fights in the past five years. The Brazilian entered the UFC with great hype after defeating the likes of Alistair Overeem and Dan Henderson in his Pride FC career, but his time on the sidelines has reflected poorly on his recent resume. There is a reason Bader is the more than three-to-one favorite heading into the fight. Bader not only holds a win over Nogueira at UFC 119, but he has steadily improved his technical striking offense, a potential key factor in this fight. In the main event of UFC Fight Night 99, Nelson was scheduled to headline the fight card in Belfast, his adopted home since joining John Kavanagh at SBG Ireland. Then he suffered a freak injury during a UFC open workout that led to the scrapping of the fight. The card took a major hit when Nelson fell out of his scheduled bout with top-10 welterweight Kim. The bout getting cancelled due to Nelson’s injury was unfortunate. However, the UFC put together a stellar replacement fight featuring top-10 middleweights Mousasi and Hall. The Nelson-Kim bout had potentially major implications at the bottom half of the top 10 of the 170-pound division. The rematch between Mousasi and Hall could have just as much meaning in the middleweight ranks. Yoel Romero earned the next shot at Michael Bisping’s middleweight title with his third-round flying-knee knockout over former champ Chris Weidman at UFC 205 last weekend. Top contenders Ronaldo “Jacare” Souza and Luke Rockhold were scheduled to meet for a potential shot at the title, but Romero’s impressive victory and Rockhold’s ill-timed injury gave way to Romero’s shot at the title. The replacement main event for the previously scheduled Jacare-Rockhold event features top-10 middleweights Derek Brunson and Robert Whittaker facing off for ever-important positioning in the middleweight rankings as well. Mousasi and Hall meet with similar implications on the line. In the first meeting between the two, Mousasi was a heavy favorite. 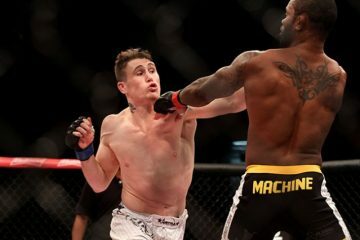 He quickly showed why that was in the first round when he took down Hall almost immediately and then completely controlled The Ultimate Fighter finalist for almost the entirety of the round. After the bell in the first round, the momentum of the fight was completely in Mousasi’s favor. That all changed with one spinning back kick from Hall. The Jamaican-American spun with ferocious intent just 10 seconds into the second frame. Some say it was luck, while others call it timing, but whatever you call Hall’s spinning kick to Mousasi’s jaw, there’s no doubt it changed the course of the fight. Hall didn’t relent in his attack. He put Mousasi down with a flying knee and kept the strikes coming until the referee was forced to step in to call the fight. Hall became the first man to ever stop Mousasi in Mousasi’s 44-fight career. That’s why this main event is so intriguing. Mousasi is the superior fighter in many aspects of the sport, but Hall’s explosive offensive techniques make his extremely dangerous given the opportunity to land. What goes agaisnt Hall in many of his setbacks is his fight IQ, along with some inconsistent game-planning. Hall has lost both of his bouts since the big upset over Mousasi in September 2015, including his most recent knockout defeat against the aforementioned Brunson. Mousasi has put together an impressive string of wins since the first meeting with Hall. He had dominant performances against Thiago Santos and Vitor Belfort. Mousasi has hovered around the top of the sport for many years, but it seems like now he is putting it all together for the first time in his career. He’s combined his in-cage performances, which include five victories in his past six fights, with his personality to finally become a player at the top of the middleweight division. The loss of Nelson-Kim at UFC Fight Night 99 hurt, but the rematch between Mousasi and Hall is a spectacular fight, and the much more intriguing main event of the weekend. Carey: The Mousasi-Hall fight is definitely the most intriguing main event of the weekend — outside of Bellator’s lightweight title showdown between Michael Chandler and Benson Henderson fight — which is exactly why it was Fight Night 100 that took the bigger hit by losing Gustafsson. While the scrap between Nelson and Kim was a fantastic fight pairing and one that should definitely be rescheduled as a main event somewhere down the line, the rematch between Mousasi and Hall isn’t much of a step down in terms of quality or name recognition. While it may have been a bit depressing for the Irish fans to lose a fan-favorite like Nelson, who’s one of Conor McGregor’s main sparring partners, this is still a great fight on a card loaded with them. Brazil didn’t get quite as lucky, losing a bona fide star in Gustafsson and instead getting a rematch that wasn’t probably high on the wish list of most fight fans. It’s not that a clash between Bader and Nogueira is a bad fight or that the two fighters are irrelevant. It’s just that no one is going to take either of these two seriously in the light heavyweight division until they beat one of the four guys that have dominated the weight class for the past few years. Unless you can pull off a win over Jon Jones, Daniel Cormier, Anthony Johnson or the aforementioned Gustafsson, then you’re out of luck when it comes to respect in the light heavyweight division. On the other card, Mousasi has left no doubt that he’s a legit contender with his dominating performances during his winning streak since dropping the fight against Hall. If the former Strikeforce champ can come out and dominate, as I expect him to, we’re getting a solid fight between Mousasi and one of the plethora of amazing match-ups he can have against the middleweight top five. If he gets caught again and Hall makes it two-for-two against the veteran, then we’re guaranteed to see something awesome added to “Primetime’s” highlight reel. Seems like a win-win. Of the four men mentioned in the above question, which one will experience the biggest jump up the ladder following Saturday’s pair of events? Carey: I’m picking both Mousasi and Bader to emerge victorious on Saturday, but it’s the middleweight contender that is going to see himself get a nice little bump in competition. The Bader-Nogueira fight will go pretty similarly to the first time they went at it. 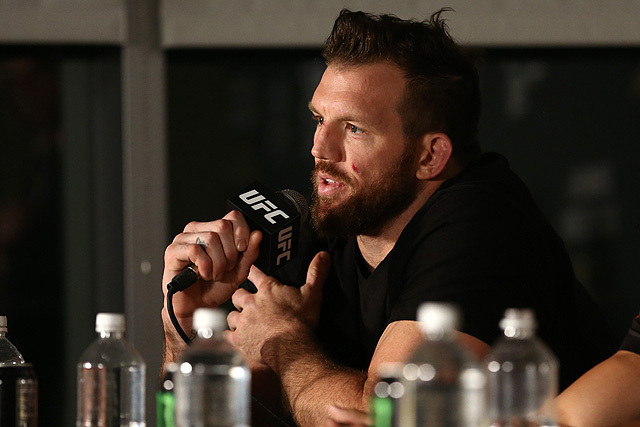 Bader knows he has the advantage when it comes to the clinch, and he’ll use it if necessary. However, he was also able to box with Nogueira without much difficulty while landing the occasional takedown to keep the Brazilian honest. It was a brilliant strategy, and Bader has only gotten better with age in terms of his skills. It should be a pretty clear-cut decision win for the Arizona State product. When it comes to Hall and Mousasi, things aren’t so easy to lay out. The former Strikeforce champion Mousasi has been adamant that Hall hit him with a lucky shot and that he would normally beat the TUF alum. It’s hard to disagree. While I’m not trying to take anything away from Hall’s earlier win, I don’t think he can replicate the performance. Mousasi has been one of the more underrated fighters on the UFC roster since he arrived in the Octagon, and he’ll erase the blemish on his record by earning a little bit of revenge against Hall. So, why Mousasi over Bader? Well, mostly because Bader has fought nearly every single name above him in the rankings and come up short. “Darth” is currently sitting at No. 4 at 205 pounds, and the only guy above Bader that hasn’t already taken him out is Alexander Gustafsson. While that’s certainly a high-profile opponent for Bader, we’ve seen him in high-profile fights before. It won’t mean much unless Bader gets the big win. Mousasi, on the other hand, hasn’t fought many of the top guys in his weight class quite yet. If he pulls off a fourth straight win, it will be tough to deny him a shot at a top contender. Edge, Mousasi. Aittama: I won’t argue with my colleague’s take on Bader’s outlook in the light heavyweight division. He had his opportunity to fight for a chance for the next title shot, but he lost. 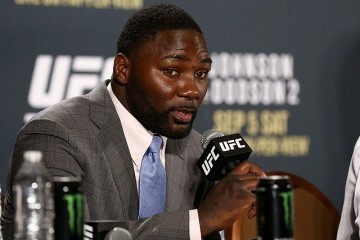 He was even scheduled to headline UFC Fight Night 68 in New Orleans opposite of Daniel Cormier, before Cormier was pulled from in the card in favor of his own title shot against Anthony “Rumble” Johnson. Cormier is still the current light heavyweight king with Jon Jones on the sidelines due to a failed USADA drug test. Bader has yet to face Cormier in his career, which does leave an opening for Bader to potentially slide into the title picture with a few strong performances in a row. That window of opportunity could potentially close again if Johnson walks into the cage at UFC 206 in Toronto and steals the belt from the champion. The second thing going against Bader is the depth of the division. There is a clear divide between the upper echelon of the division and Bader. There is a clear top three in the division: Jones, Cormier and Johnson. Then there are top guys like Gustafsson and Glover Teixeira. Bader has suffered defeats to three of these fighters. He comes in just after these top guys, a place where he has been firmly entrenched since his five-fight winning streak. Bader has yet to fight Jimi Manuwa, Gustafsson and some of the guys just outside the top 10. A win over Nikita Krylov or Gian Villante won’t earn Bader a shot at the title. As it stands, he is a good two or three wins — not including a win this weekend — away from a shot at the crown. Mousasi will put on the best performance and have the most to gain coming out of the weekend. If he gets his revenge on Hall, then he will solidify himself as one of the division’s top title challengers. A win on Saturday morning would give Mousasi four straight and six wins in his past seven fights. The only fighters with more consecutive wins are Derek Brunson and Robert Whittaker, both of whom have five straight victories. The only other fighter with a clear path toward the title is Ronaldo “Jacare” Souza, who has won nine of his past 10, with his only loss coming in a controversially scored bout with Yoel Romero, the man getting the next shot at Bisping. Most pundits believed the fight should have been scored a draw. Because Jacare has the best body of work and his scheduled bout with Luke Rockhold fell through, what happens after Bisping fights Romero in the future is anyone’s guess. If Mousasi comes out of the weekend unscathed, he could potentially face a fresh match-up against the winner of Brunson-Whittaker or the former champion Rockhold. Or maybe the promotion would put together a second fight between Jacare and Mousasi on the same card as the Romero-Bisping bout. However the UFC approaches the middleweight division, Mousasi will be involved at the top following his win over Hall this weekend. Pick a card, any card! The afternoon offering from Ireland features a ton of international talent and a headlining fight that is probably the most important bout of the weekend. The evening lineup from Brazil has a handful of ranked fighters and the overall bigger names in Antonio Rogerio Nogueira and Ryan Bader. Both events have plenty to offer, but there’s only so much time you can spend sitting in front of your TV on a Saturday. If you had to pick just one, which card will you be watching? Aittama: I don’t know if it’s a good or a bad thing, but I’ll be in front of my TV for both events this weekend. From top to bottom, both cards have intriguing match-ups between prospects, veterans and UFC newcomers. If I was put in the position of choosing just one fight card, it would be a tough decision. For the people who usually don’t have six or seven hours to spend watching UFC action on Fox Sports 1, thankfully the UFC has opted to put the preliminary card on UFC Fight Pass. The promise of not having to wait through the horrendous FS1 pacing should turn many in favor of UFC Fight Night 99 in Belfast. The only problem is that the event clashes with marquee college football match-ups featuring Ohio State, Wisconsin and Texas A&M. That is one of the many benefits to the Fight Pass cards: if you can’t catch the event live, it’s a matter of hours before you can watch the replay. When it comes to the fights, UFC Fight Night 99 features top-10 middleweights in the main event, a flyweight showdown between Kyoji Horiguchi and Ali Bagautinov, and a plethora of quality prospects. England’s Ross Pearson takes on short-notice replacement Stevie Ray in a battle of Scotland-vs.-England. Former Bellator heavyweight champ Alexander Volkov makes his UFC debut opposite Timothy Johnson. Top flyweight contender Ian McCall finally returns to the Octagon after a string of unfortunate events. McCall takes on Ireland’s Neil Seery in the final fight of his career. Team Alpha Male prospect Teruto Ishihara looks to keep his knockout streak alive against SBG Ireland’s Artem Lobov. Add in the top prospects and the match-up of undefeateds Brett Johns and Kwan Ho Kwak, and the Fight Night in Belfast is a solid card despite the lack in name value. 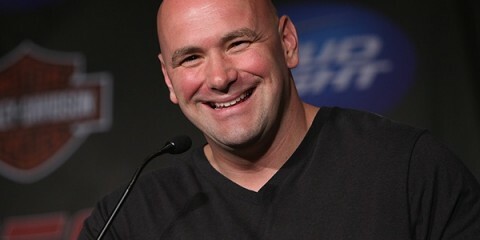 UFC Fight Night 100 features matchmaking geared toward exciting fights against top competition. Bantamweight contender Thomas Almeida takes on Albert Morales, middleweight contender Thales Leites returns to Brazil against Poland’s Krzysztof Jotko, strawweight title challenger Claudia Gadelha takes on exciting American Cortney Casey, TUF Brazil 3 winner Warlley Alves meets TUF 21 winner Kamaru Usman, and top-10 flyweight Justin Scoggins moves up to bantamweight against former Resurrection Fighting Alliance champion Pedro Munhoz. Both cards have their draws, but if I only had to choose one, I would pick UFC Fight Night 99. Carey: Once again I’m going to have to agree with Mr. Aittama. UFC Fight Night 99 is probably the superior card, and the Fight Pass pacing is such a huge selling point that it might be enough to convince me to pick the live stream over most televised cards. Yet, I’ll likely also end up sitting in front of my television for both events. The nighttime card in Brazil has a number of really interesting showcase fights for top talent like the aforementioned Almeida and Gadelha, but there are a few hidden gems that should end up giving us quality fights instead of quality performances. The bantamweight debut of Scoggins in particular is very interesting, in part because his opponent, Munhoz, should be a great test for the first time 135er. The battle of TUF winners between Alves and Usman is another to keep a close eye on, as it’s a tremendous clash of styles. Usman is as frustrating as they come on the mat and has proven to have the wrestling skills to make opponents miserable, but he’s going to have to avoid the lethal striking ability of Alves long enough to get the fight to the floor. Still, despite a few good match-ups, it’s hard for Brazil’s Fight Night 100 to compete with the depth that’s going to be on display from Belfast. Even if you look past the fact that Ireland’s Fight Night 99 has the superior main event, the card as a whole features a ton of high-level European talent, both old and new, looking to make their mark in the Octagon. Whether it’s watching a veteran like Pearson get himself into the usual war or checking out featherweight prospect Ishihara’s progress in the cage, the card has a little something for everybody. These fight cards feature a wealth of prospects either making their UFC debut or returning to the Octagon after a couple of fights. Which fighter(s) seizes the opportunity and scores the best performance of the night? Carey: This is an extremely difficult question to answer. The Belfast card in particular is littered with former champions from organizations like Cage Warriors, BAMMA and even Bellator making their Octagon debut on Saturday. I could see Jack Marshman making some waves at 185 pounds, and both Mark Godbeer and Alexander Volkov could easily end up cracking the heavyweight rankings eventually. However, if there’s one fighter I’ll be keeping my eye on this weekend, it’s going to be bantamweight prospect Brett Johns. At just 24 years old and already having earned championships in both Cage Warriors and Titan FC, “The Pikey” is one of the more interesting prospects to come out of the United Kingdom over the last few years. Currently sitting at 12-0 with wins over tough guys like James Brum and Walel Watson under his belt, Johns has a ton of potential to be one of the next breakout stars in the bantamweight division if he’s able to continue his current streak at the next level. He’ll get that chance against a top Asian prospect in 9-0 Kwan Ho Kwak and I’m expecting Johns to look every bit as good as advertised in a tough match-up. With most of his wins coming by decision, Johns may seem like an odd pick to make a statement with a “Performance of the Night” display, but this fight has the potential to be a really good scrap and become one of the most memorable fights in a long day of UFC action. Maybe I’m wrong, but I have a feeling we’re going to be talking about Johns around the watercooler on Monday. Aittama: There are plenty of prospects capable of making a big splash this weekend. From the first fight of the weekend to the exciting battle between Thomas Almeida and Albert Morales in the co-main event of UFC Fight Night 100, this fight card features a plethora of top talent. Since my colleague decided to talk about the great match-up between Johns and Kwak, I’m going to play devil’s advocate to his pick of Johns. The Welshman has carved out a name for himself in the U.K.’s MMA scene. Johns began his MMA career just five years ago, but he has already cemented his name as one of the top bantamweights outside of the UFC. He fought on the regional circuit before picking up a huge one-night, four-man tournament win with victories over David Haggstrom and Jordan Desborough. Those victories earned him a shot at James Brum’s Cage Warriors bantamweight title. Johns took home the strap and returned to the cage in the United States with Titan FC, where he won the vacant bantamweight belt against the aforementioned Watson and defended it against TUF alum Anthony Gutierrez. Johns has been outside of the cage since his title defense at Titan FC 34 in July 2015. He was scheduled to fight multiple times since, but injuries and other factors have kept him outside of the cage despite finding the time to continue training and improving. However, Johns’ potential ceiling is up for debate, which is where my colleague and I differ on who could come out of this fight victorious. The record is impressive, but Johns hasn’t always been so impressive in the actual fight. He’s shown the ability to go five rounds, but there are still holes in his game. 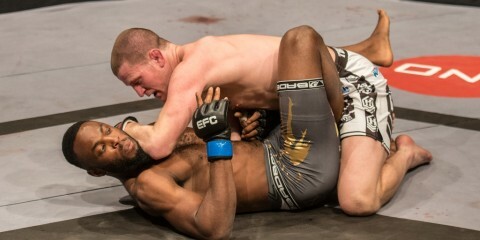 Johns is a solid wrestler and a good grappler with a knack for wrapping up submissions. Where he needs some work, though, is in his stand-up and defensive abilities. Those openings could potentially be exploited by his South Korean foe. Kwak is an exciting striker with a knack for spinning attacks and flying knees. His highlight reel is truly one to behold. Kwak is a superior athlete training under the tutelage of former UFC title challenger “The Korean Zombie” Chan Sung Jung at Korean Top Team. Kwak has impressed with title-winning performances in PXC and Top FC just three years into his MMA career. He picked up big wins over former PXC champion Kyle Aguon and UFC veteran Alp Ozkilic in his last two fights. Those performances are likely what earned Kwak an opportunity to showcase his skill set on the biggest stage in the sport. While Johns is a solid prospect, don’t be surprised if he gets taken out by the dynamic South Korean. Which fight is the sleeper match-up on this pair of cards? Aittama: The flyweight showdown between top-10 fighters Kyoji Horiguchi and Ali Bagautinov might have a case for being the best fight on UFC Fight Night 99. While many fans may have had their fill of MMA at UFC 205 last weekend, there are some fights that just scream excitement on the upcoming cards. This is one of those fights. Horiguchi has a fearsome striking style that has resulted in nine knockouts out of his 17 career victories. His karate-based style gives him excellent distance management and the ever-important ability to close distance in the blink of an eye. The 26-year-old’s striking gets even more dangerous because of his willingness to exchange at all ranges, his ability to score coming in and out, and the incredible power in his left hook and right hand. Horiguchi is not known as a knockout artist, but the UFC’s top Japanese fighter has scored more than 20 knockdowns in his professional MMA career, an incredible feat unmatched by most bantamweights, let alone a flyweight. Horiguchi has won six of his seven Octagon appearances. His only loss came against flyweight champion and pound-for-pound king Demetrious Johnson. Bagautinov has fought for a title against Johnson as well. The champ took a measured approach against Horiguchi, recognizing the danger he brings in the stand-up game. While Bagautinov is a capable striker, Johnson made no qualms about aggressively pursuing a finish on the feet against the Russian. Johnson relentlessly attacked Bagautinov in what would become a beatdown from bell to bell. The 31-year-old lost his next bout to perennial contender Joseph Benavidez before returning to the win column against Geane Herrera at UFC Fight Night 89. Bagautinov did test positive for a banned substance in his title match-up with Johnson, though, and has yet to return to the form that earned him victories over top-10 bantamweight John Lineker and TUF 24 fighter Tim Elliott. The question marks for Bagautinov, combined with Horiguchi’s exciting style, make for what should be one of the best fights of the weekend. Carey: We’re sticking around in Belfast for this one, with a battle between exciting up-and-coming lightweights Kevin Lee and Magomed Mustafaev. The 28-year-old Mustafaev has been hiding under the radar since making his debut in July 2015. He quietly dispatched Joe Proctor and Piotr Hallmann, a pair of really good fighters, to kick off his Octagon career. He gets the chance to take out one of his division’s brightest young prospects, Lee, a 24-year-old “Motown Phenom” who has put together a 6-2 record in the UFC. On a day full of sneaky good fights — Justin Scoggins against Pedro Munhoz and Brett Johns against Kwan Ho Kwak come to mind — this might be my favorite one of all. Carey: Some energy drinks! As if we weren’t already suffering from a bit of fight fatigue after last weekend’s epic UFC 205 event, the UFC is throwing a full day of fights at us just seven days later. If you’re in it for the long haul, I’d recommend some Red Bull or Monster to help keep the adrenaline going. It’s going to be a long day. Aittama: A scrapbook. With WME-IMG’s purchase of the UFC, it looks like fans are in store for a scaling back of the product in 2017. This may in fact be the last time there will be two fight cards on the same day for the foreseeable future. So instead of skipping these events because you got your fill of combat at UFC 205 last Saturday, enjoy these events for what they are — action-packed fight cards. Take it all in so you can remember that one time where you made it through two UFC events in one day.